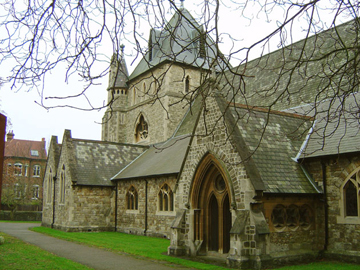 Since arriving at Christ Church, I've been enormously impressed by the dedication and generosity of so many people in giving their time, energy and money to the life of the church in West Wimbledon. I’m also very aware that we are part of a long tradition of Christian men and women who, for the last 150 years have given generously and often sacrificially to ensure that Christ Church remains the flourishing community it is today. We are a church blessed with wide diversity being made up of young and old, working and retired, established Christians and those relatively new to faith. We can be thankful for a tradition of looking after our church buildings and developing them to serve the needs of the parish. We can be proud that we look after our people and encourage everyone at Christ Church to know that they have something to contribute to the church, that there is a place for them and that we are here to enable everyone to better hear God's call in our lives. Part of a successful church community is a regular check to make sure that our giving adequately provides for the mission of the church. We need to thank those who have given in the past but also regularly review our giving so that together we can take Christ Church forward into the next phase of our life and mission as God's people in this parish. Alternatively, click on the Giving Form link below to download a form (PDF file).